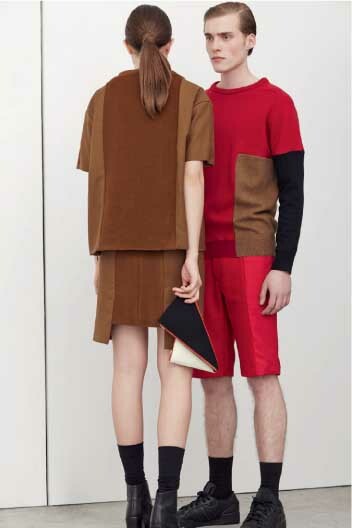 With a title “Colours of Germany”, it’s easy to deduce that the collection was inspired by the German flag. Being inspired by their home country’s colors is not a novel idea; but this is the first time that a collection based on a country’s colors is made from recycled clothes. As a backgrounder, each piece of Schmidttakahashi‘s collection is a product of the continuous recycling process. The first line is called “Unikat” – unique piece – and is invariably designed and constructed from used clothes. This means that the designers actually ask for donations of old clothes and those materials are given a new lease on life by using them to create a new garment. Back to the “Unikat” – an ID number and a QR-code are attached to each item, which offer access to the corresponding information on the website www.schmidttakahashi.de. According to the applied garments, product details, colors and materials vary in this line. The second line is called “Duplikat” – duplicate – and is composed of selected designs from the “Unikat” line, which are reproduced as limited editions. At least one small part of each “Duplikat” item comes from used clothes. Thus every piece in this line is also part of the “family tree” of Schmidttakahashi and can be retraced by its ID number and QR code. With that explained and going back to the Schmidttakahashi Fall/Winter 2014-15 collection, with the colors very specific, the designers were very concise and specific when they were asking for donations. And though there were only three colors being asked for, there were so many shades and as many nuance in the fabric that it was a challenge to stay within the theme. But they persevered and stayed true to their vision. The collection became a harmonious composition of different materials with the clean and clear silhouettes being the cord that bind.